Subscribe to comments with RSS or TrackBack to 'Your 2018 Nats Draft Class'. Braves, D-Backs, and Dodgers all whiffed on signing their first-rounders, all high schoolers who wanted overslot. The scuttlebutt is that the Braves may have low-balled their pick, at just around the 40% mark required to get the comp pick next year. Sorry, but I hate that rule. Teams should be required to offer at least 75-80% of slot to qualify for a comp pick. I’m not sure the comp pick should be so high, either. In fact, the rule encourages exactly what we seem to have seen: the Braves basically toss back the pick this year so they’ll have a top-10 pick next year instead of picking in the 20s, where their record would put them. For the 2018 draft, I don’t particularly like what the Nats did with their top three picks, but I do like what they did in several slots thereafter. And as with the 2017 draft, I think they over-prioritized pitchers. The 2016 draft, in which they seem to more realistically taken the “best available” approach, seems to be panning out much better than the ’17 class. As I’ve stated too many times, I would have preferred either a college pitcher or Seth Beer (take at pick #28) for the first pick. It’s not just my aversion to high school arms. It’s that they need someone who can move up more rapidly into the pitching-starved upper minors (particularly in the wake of the Romero debacle), plus they could have paid a college pitcher left and perhaps had more cash left to draft a higher-ceiling guy in the second round. I think Cate is fine for what he is, but his ceiling looks to be about Matt Grace. That said, after seeing Kowar abused for 121 pitches in the super regional, and the Oregon State frosh for 129 pitches in the CWS final, maybe it is best to fear the ravages of starting in college. Can Schaller stick as a starter, or be a 99-mph reliever? I’m skeptical of either. 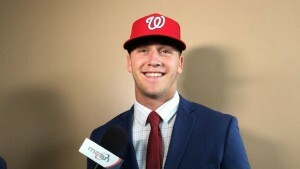 The whiffs on Lawson and Chapman are perplexing, particularly considering that the Nats just took and signed a pitcher for the same program last year. So, is $3,000 The new minimum? It was $1,500 for a long time. 29 out of 40 is a good return. I dunno if $3,000 is the new min. I saw 2500 a lot in the past couple of years. I sure hope the J-Rod experiment is over, with a 6.86 ERA and 1.68 WHIP. Maybe Voth will get the next start in that rotation slot on Saturday, although I don’t have great confidence in him, either. Well, for what its worth, it is good to note that Jefry Rodriguez is technically our #8 starter. Scherzer, Strasburg, Gonzalez, Roark, Ross, Hellickson, Fedde, Jefry Rodriguez. will our #9 starter (Voth) fare better? who knows. It certainly doesn’t help matters when (at the same time) your numbers 2,5,6 and 7 starters are hurt. Very few teams could survive that for long … and then on top of it your #3 and #4 starters have been regularly sh*tting the bed for a month. Maybe they made a mistake letting Ejackson opt out; it probably was more due to bad timing. jackson opted out on 6/1/18 … then Hellickson got hurt on 6/5 and Strasburg on 6/10. Just a week later and we’d be having Ejackson pitching solid starts for us instead of oakland. Maybe its time to bring up either Milone or Philips Valdez. Valdez’ numbers don’t look half bad this year across AA/AAA. Milone is a known quantity but may have lost his effectiveness 3 years ago. That being said (in response to restocking the system through the draft) as much of a proponent of Giolito as I have been, its hard to look at his performance this year (or Reynaldo Lopez’s for that matter) and make the claim that we’d be any better off giving starts to those two instead of hellickson/Fedde/Jrodriguez. Giolito has as many walks as Ks this year and is sporting a 6.59 ERA. Lopez’s ERA looks a ton better at 3.77 but its a mirage: his FIP is a point higher, he’s got a meager 6.4 K/9 rate and he’s skating by on a sub-average BABIP. And Dunning is hurt (but is putting up excellent AA numbers). Can you make up for that with a specific 1st rounder in 2018? No you can’t; even the best 1/1 college pick won’t be ready until late 2019 or april-may 2020 at the best; long after our current issue is gone. Honestly its looking more and more like the big loss was Luzardo, who is representing Oakland in the Futures game and has been racing up the prospect charts. The Nats have very, very few legit starter prospects in the top three levels of the minors. In fact, Fedde and Crowe are the only ones I would truly label “starter prospects,” although others may differ. I’ve never been a big fan of Jefry Rodriguez and still think he’ll end up in the bullpen. I did think well of Voth through 2016, but he’s withered on the vine. It has been very curious how the Nats have resisted calling him up over the last three seasons. Fedde is still considered a “prospect,” yet he’s three months older than Joe Ross. It’s really now-or-never time to find out whether Fedde is a major-leaguer. Ross is on track to be back sometime, but more the Aug.-Sept. time frame, and he’ll be innings-limited if he’s in the rotation in 2019 while coming back from TJ. The Nats not only have the 2018 rotation to consider, but 2019 as well, when Gio (the only lefty) presumably will be gone, Roark may not be worthy (he may not be right now), the #5 slot will be open again, and Ross will be good for perhaps only 2/3 of the season. Roark’s contract is up after 2019, and Stras has opt-outs after 2019 and 2020. Beyond the top three levels, the starter prospects aren’t much better. Romero’s travails have been well-documented, and he’s now hurt. Raquet did get promoted to A+ but has been rocked there. Between injuries and ineffectiveness, the rest of the vaunted 2017 pitching class (9 of the top 10 picks) isn’t looking good. Maybe Denaburg turns out to be terrific. But the Nats are going to have to do a whole lot of juggling in the meantime before he arrives in 2022-23. Heck, they need to do some juggling right now. When we’re wondering what Tommy Milone still has left in the tank, we may have a problem . . . I never understood why they didn’t call EJax up as the long man, all the more so as his June 1 opt-out approached. Yes, he would have had to have been added to the 40-man, but I can name five easily replaceable guys who could have been DFA’d. They could have brought up Jackson instead of Suero. Yes, they were keeping him “stretched out” at Syracuse, but he’s been pretty rubber-armed through his career, so he didn’t need much stretching. In retrospect, this seems like a big “oops,” all the more so considering how well he has pitched in OAK. Team drops 2 of 3 in Pittsburgh against a team barely trying this year. Shutout by a guy with a 4.60 ERA on the year. I’m losing hope for 2018. Yeah, so much for the big 11-game push and the supposed surge from Thurs/Fri/Sat. They’ve since lost three of four, two due to bad starting pitching and one due to terrible hitting. Sigh. Positives notes: Gio seems “back” while working with Wieters. Don’t know that that’s all of it, but he looked much better. Hellickson was terrific, albeit for five innings. I’ll take that over five innings of Roark or Rodriguez any day. That would be the same Roark who is facing Thor on Friday. I’m guessing the Nats will be starting Voth on Saturday. Also, Murphy had four hits on Tuesday so is close to finding his timing at the plate . . . just in time for a visit to Citi Field. Alas, he still has the mobility of a beached whale. The best-case scenario is probably that they make it to the break no worse than six games out. Part of the reason not to give up hope is that there are no guarantees that the Braves and Phils are 162-game teams. I do think the Nats are going to need to make a trade and replace Roark in the rotation. (Can’t believe I’m saying this, but he may be a non-tender candidate unless things change soon.) If they add another starter plus have Ross and Glover on the horizon, I think the pitching will be OK, particularly if they get a strong second half from Stras. Among the hitters, no one has any idea about Zim, but it seems fair to say that he won’t be seen until August at the earliest. Robles is playing in the GCL but will probably need a few weeks. Still not sure how/where he fits even when he’s ready. If they trade for a hitter it would likely be a catcher. It’s possible that Raudy Read gets a look before they invest, though.